Doing work you love and getting paid well for it is the pinnacle of success. But many people don’t attain that enviable twofer, so they settle for one or the other, either financing a cushy lifestyle through a job they don’t particularly care about or pursuing work they’re passionate about even if it requires financial sacrifice. Then there are the no-fers who end up doing work they don’t like and getting paid poorly besides. 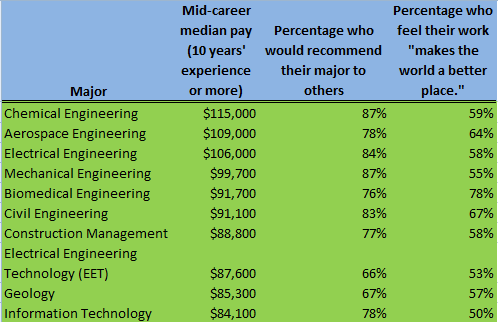 Nobody sets out to have a busted career, of course, but a lot of workers drift into unrewarding careers because of the college major they choose and the narrow pathways it may lead to if they don’t branch out or build new skills. 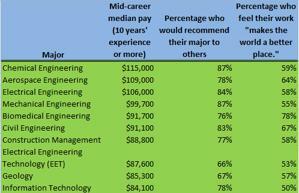 And now, new data from compensation-research firm Payscale reveals which majors are most rewarding, as well as most disappointing. 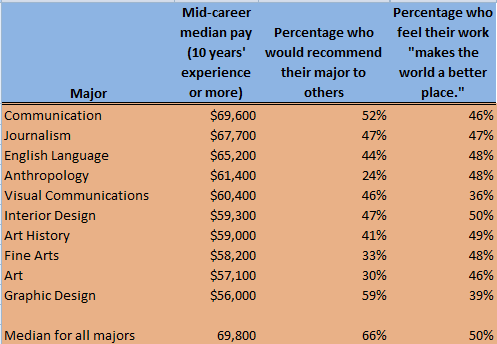 Many of those majors, of course, lead to fields in which there are too many applicants for too few jobs, which usually pushes down pay for those who do get work. Some employers still emphasize the importance of a well-rounded liberal-arts education, but hiring is still a buyer’s market these days, allowing most companies to choose from many well-qualified candidates. The result is a lot of liberal-arts grads working as waiters and retail clerks, often with thousands of dollars of student debt they must repay. No wonder they’re bummed out. One thing such data don't capture is the extent to which creativity, initiative and entrepreneurship allow driven people to catapult forward, no matter what they study in school. Billionaire investors Carl Icahn and Peter Thiel were philosophy majors, as was retired NBA head coach Phil Jackson. Actress Julianna Marguilles of The Good Wife studied art history. And broadcaster Howard Stern was a communications major. It might have been worth studying that just to hear him sound off in class.